Well, I suppose the only memorable conditions this year were weather-related . Sadly, there were no good openings into the continent, unlike last year when working DL and similar distances became almost mundane! We had made a number of changes to the equipment over the winter months. 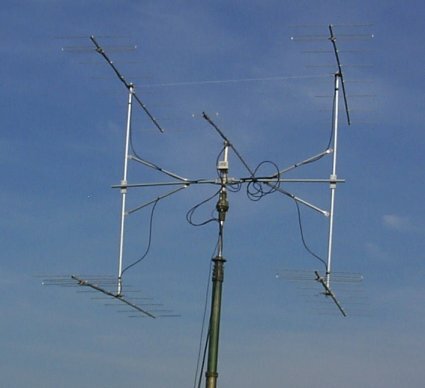 The antenna system for 2m was an array of 4 x 9 element Tonnas from their Professional range. Although the performance is identical to the standard 9 element Tonna, mechanically they are far superior. Masthead pre-amp was our trusty SSB Electronics SP2000 with the gain wound down to about 10dB. 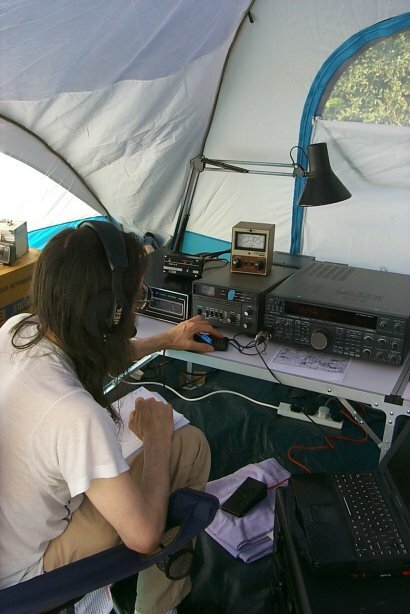 New gear in the tent this time - a Kenwood TS950SDX driving a Yaesu FTV-107R transverter. Linear amplifier was a Dressler D200S running a clean 250W output. The TS950 has a built-in voice keyer, so all we had to add was the Heil headset. 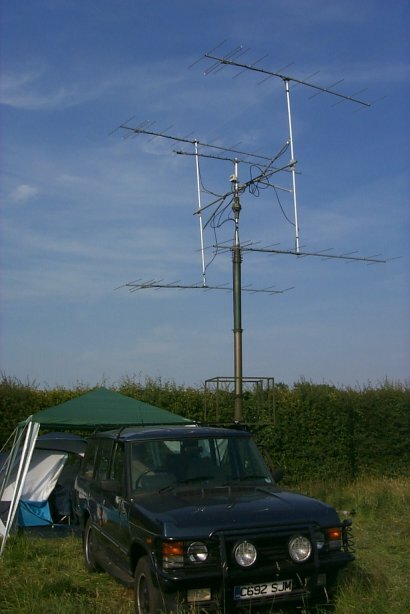 Learning from our mistakes on last year's NFD, we used a rotator for the antennas and spent much more time covering the UK. This was just as well, because apart from a couple of brief tropospheric openings into France and Germany, conditions towards the rest of Europe were flat. 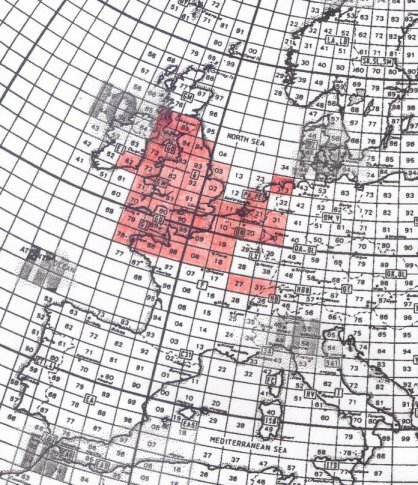 Looking at the locator squares, it seems that the higher power and larger antenna paid off, as we did cover all the closer squares thoroughly.....it's just that the DX wasn't there. Last year, with lower power and lazy rotating of the antenna by hand, there were large gaps in our coverage of the UK. 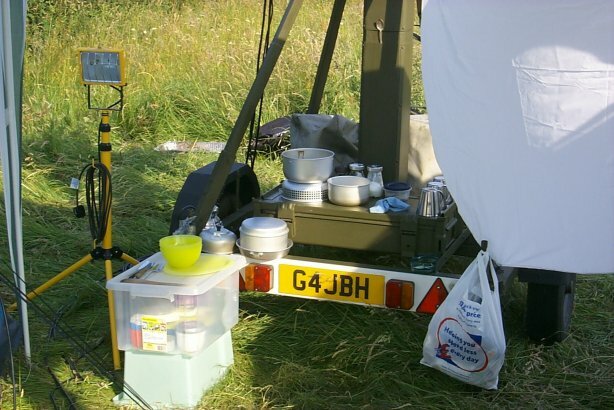 Going back to the openings that we did have............at 0700 hrs on Sunday morning we were called by three German stations in JO31 over a period of six minutes and these averaged a distance of around 700Km. Our best DX of the weekend was worked a couple of hours later - F5KMY/P down in JN37 at a distance of 823Km. Just prior to that, we had worked into JN27. Close-up of the antennas Close-up of the kitchen - mobile towers are so versatile!